An attorney representing a policeman acquitted of involuntary manslaughter on Monday said this: “These peace officers were doing their jobs…they did what they were trained to do”: beating a homeless man to death, as he screamed for help. What was I thinking? I was so naive to even consider that the policemen caught on surveillance cameras beating Kelly Thomas to death in Fullerton California in the summer of 2011 would be held accountable. I lived through Rodney King and, of course, Amadou Diallo and Sean Bell and so many others. So, I should have known that these officers would be exonerated. Because, while Kelly Thomas was white, he was homeless and schizophrenic. Police officers in Fullerton, CA were responding to reports about a man seen trying to break into cars near a bus depot on July 5, 2011. The police say Thomas, 37, fit the description and ran away after they found items belonging to someone else in his backpack. According to the police, Thomas resisted, so they called for backup and ultimately 6 officers were on the scene. The police say Thomas, who was unarmed and weighed 160 pounds was so strong and so resistant, that their force was necessary. But witnesses, medical reports and video say otherwise. The cause of death “compression of the thorax,” that made Thomas unable to breath. Medical records also show that Thomas’s had bones broken in his face, choked on his own blood and was stunned with multiple times with two Tasers. When the paramedic arrived, he was told to attend to an officer with a minor injury. But the paramedic couldn’t help but notice Thomas as he lay in a pool of his own blood. Ron Thomas, Kelly’s father and a former sheriff, said, ”Nobody at all from law enforcement directed them to Kelly. Kelly is dying in the gutter.” The paramedic had to clear Thomas’s nose and mouth of blood and his heart stopped on the way to the hospital. 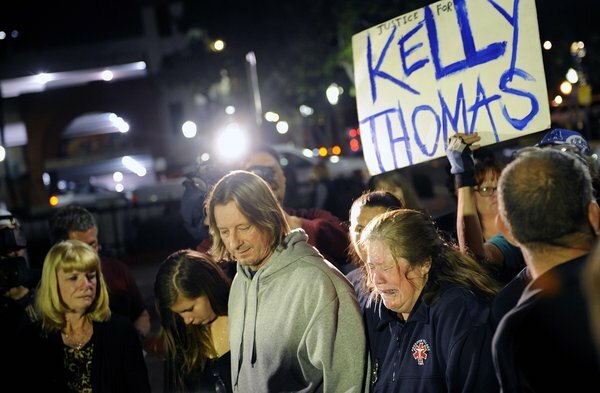 Kelly Thomas was removed from life support and died five days later. Despite the overwhelming evidence, Ramos, 39, was acquitted of second-degree murder and involuntary manslaughter. Cicinelli, 41, was acquitted of involuntary manslaughter and excessive use of force. Ramos’ attorney, John Barnett, actually said, out loud, the following: “These peace officers were doing their jobs…they did what they were trained to do.” Apparently, murdering unarmed people is just part of the job. The FBI is going to revisit the case, in light of the acquittal. But when will shocking police brutality stop being so un-shocking?